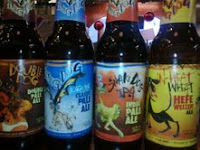 Deveneys of Dundrum: Flying Dog range 2011. I spent a miserable J1 summer in Maryland a decade ago. My surprise when I discovered this great beer 7 years later and that actually something decent had emerged from the east coast U.S counterfeit Bray. To any of my readers from in or around that neck of the woods - I can't apologise for my blatant slating. I still have difficulty passing a ''Pizza Hut'' without experiencing flashbacks of a bad uniform and free refills. Hunter S. Thopmson and thus led to inspiration. Each bottle bears the famous Thompson quote : ''Good people drink good beer'' - so true! (Except for that bottle of Corona that I was caught with mid-consumption by a highly vocal customer in Smyth's last week) Sometimes good beer is difficult to acquire. Flying Dog is currently available through Deveney's of Dundrum. Unfortunately I could only pre-purchase from the Brewery so availability will not be year round. As we all know I suffer label lust. I'm not going to lie. My preference is often swayed by a prettier label and or quirkier name. I do love American Hefe Beers so my first choice would be In-Heat Wheat but the Classic is really good also. The I.P.A and the Double Pale are 2 very serious beers. All 4 worth a try. "Label lust" is a lovely term. ''Fear and Loathing'' doesn't get much better than that. It's definitely for you Brian! My spider senses are telling me a trip to Barstow is in order!! !